After a one-year pause, the Heidenfest will finally be back in 2015 with ten dates in Germany, Austria and Switzerland. 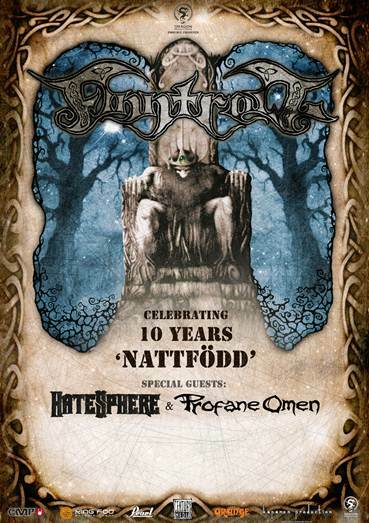 FINNTROLL are proud to announce that they’ve been invited as special guests for the extended shows in Stuttgart, Munich, Pratteln, Oberhausen, Leipzig and Vienna. See below for all Heidenfest 2015 dates. Go to this location for ticket links. Blodsvept was recorded at Sonic Pump Studios in Helsinki while mastering duties were handled by Mika Jussila at Finnvox Studios. Henri ‘Trollhorn’ Sorvali and the band produced the album themselves, the album artwork was handled by the band’s own guitar player, Samuli ‘Skyrmer’ Ponsimaa. SATYRICON, VICTORY and CRIPPER are the latest acts confirmed for the 2014 edition of The World’s Biggest Heavy Metal Cruise – 70000 Tons Of Metal, which will sail January 27th to 31st from Miami, Florida to Costa Maya, Mexico and back! 70000 Tons Of Metal confirmations now include: CARCASS, CRIPPER, DARK TRANQUILLITY, DEATH ANGEL, D.R.I., FEAR FACTORY, FINNTROLL, THE HAUNTED, LEAVES’ EYES, OVERKILL, SATYRICON, SEPTIC FLESH, SOILWORK, SWALLOW THE SUN, SYMPHONY X, VICTORY and XANDRIA. Finntroll recently released a video for the track ‘Häxbrygd’, featured on the band’s new album, Blodsvept, out now via Century Media Records. After having attracted enthusiastic reviews with their self-produced EP in 2010, the band started working on a full-length album with the supervision of renowned musician and producer Cristiano Bertocchi (Labyrinth, Vision Divine), combining their classical background with powerful guitars, huge orchestrations and epic atmospheres. ‘Shadows Over Lothadruin’ was mastered by Goran Finnberg (Opeth, Dark Tranquillity). The beautiful artwork was handled by Felipe Machado Franco (Blind Guardian, Rhapsody Of Fire). Wind Rose surely come as a pleasant surprise for every fan of Melodic Heavy Metal. Follow http://www.bakerteamrecords.com and http://www.windroseofficial.com for all the updates.